Caitlin Kidder is a senior environmental studies/international relations major at Mount Holyoke College in Western Massachusetts. She is a student organizer for her own school's divestment campaign, and is actively involved in the food justice and climate justice movements. 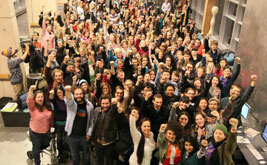 What’s Next for the Student Divestment Movement? 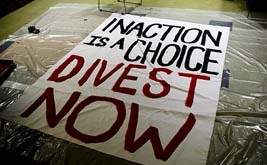 Students are rising up and taking action to make their voices heard on divestment. Everyone, from Shell and Exxon to Boards of Trustees to President Obama, should stop and take notice. A sense of urgency was palpable throughout the second day of the Power Up! 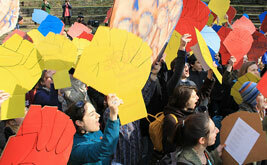 Divest Fossil Fuels convergence at Swarthmore College. Students are meeting to create a comprehensive message and plan of action for the hundreds of divestment campaigns popping up throughout the country.